Have a woven tee pattern and want to make a blouse ? Have a pullover layering pattern and want to make a jacket ? Have a sweatshirt pattern and want to make a zippered hoodie ? 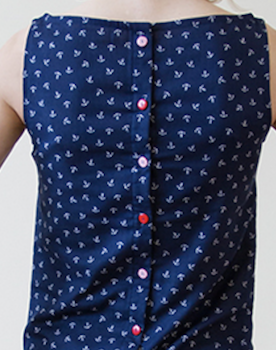 Have a personal bodice block and looking for easy open-front options to make with it ? As often with my posts, my post on closed-to-open-front pattern changes kept expanding. Which is why I said years ago I was going to write one and never got down to it. . . I’ve been thinking about it ever since I wrote a post on converting open-front-to-closed ! This first post is about front openings with zip or bands and separate neckline finish. The second post is about combined front edge and neckline facings. There are little design decisions to make. If you’re not sure what to do – have a look at RTW – snoop shop and clothes you own – and see how they deal with it. They can be a marvellous resource for making, as well as something to wear 😀 Best to snoop shop at high end. Cheap clothing lines use least materials and quickest sewing, and home sewists usually haven’t got to do that. – understand different types and widths of bands. 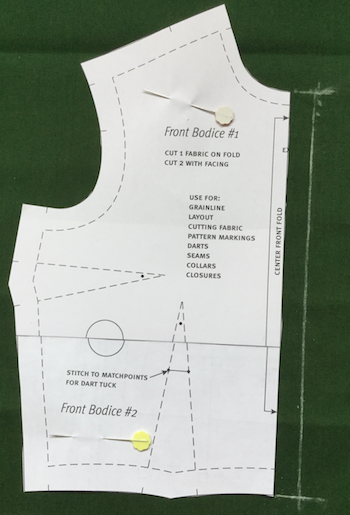 Front pattern piece with centre front line CF marked from neck to waist/hip. Pattern making courses and text books tell you how to draw your own starter pattern, called a ‘block’. Then how to alter it to make other styles. But the two stages are separate. No need to draw or even have your own block. You can start your pattern alterations from any pattern piece. Best to use ones with few style elements, or something in common with the style you want to make. – a quilter’s 6×24 ruler makes it easy to mark lines at measured distances apart. Instead of placing pattern centre front on a fabric fold – add seam allowances to centre front. Seam allowance width = width of (zip tape + teeth). No need to make a special pattern piece. Place the front pattern away from the edge of the fabric, and use a marking tool and ruler to draw the cutting line onto the fabric. At the seam allowance width from the CF line. For a quality inside finish, cover the edge of seam allowance and zip tape with bias binding. 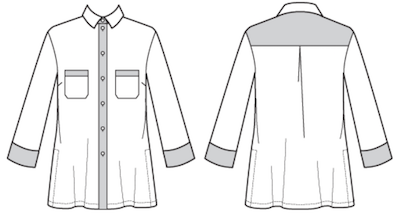 Two main methods of adding a cut-on button band, with a single fold or a double fold to the inside. If your fabric is the same both sides, you can double fold to the outside. Or add a separate band, perhaps in contrast fabric. Choose your buttons first, as the pattern making usually depends on what size they are. Buttons are usually placed on the Centre Front line. 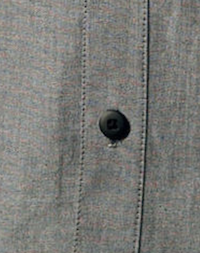 There’s usually an extension beyond that to support buttons and buttonholes. The extension is usually 1 button width. That means the two fronts overlap by 2x button width. You can of course use any size button with any width extension, but some combinations look odd. If you use different sizes – best to check the result is what you want before making the final garment. There are surprisingly many features of an opening which relate to the button size used, so with commercial patterns it’s best to use the button size in the instructions. 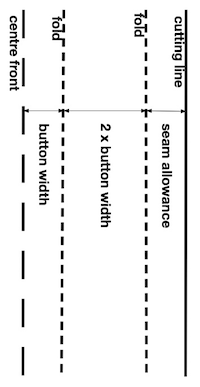 – measure width of front extension beyond CF – this is a design choice but is usually the width of button used. – measure width for fold back, usually 2x button width. 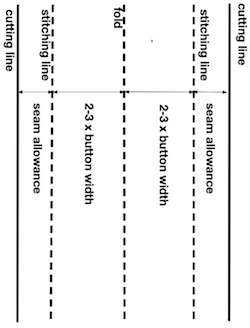 – measure added amount for inner edge finish, usually up to seam allowance width. Add interfacing onto the fold line and fold back section, to support the fold and the buttons and buttonholes. The ‘facing’ is held in place by the buttons and buttonholes. – measure extension beyond CF – width of button. – measure width of first fold back – 2x width of button.
. . . . . seam allowance or less.
. . . . . 2x width of button again – so there’s a 3rd layer of fashion fabric giving extra support to buttons, instead of interfacing. It’s easy to sew a lovely straight line using an edge stitch foot on your machine, I think that’s my favourite extra foot ! Several ways of sewing this band. 100 Acts of Sewing uses edge fold 1/4″ wide, main fold 1″ wide. Lauren Guthrie has both folds full width. She describes a back opening, but use the same method for a centre front opening. Seen more on shirts. This one has the band folded to the outside. Pattern for band may be wider to make the added strip a special feature. Same length as front edge. so need to reduce the width at CF by half the finished width of the band. You could draw folding, stitching, cutting lines direct on the fabric. But you may feel more confident if you try them out on paper first. Fold up the band pattern and hold it up on you – does the width look right ? She finishes the band by hand, using ladder stitch. Alternative : fold the band so the edge is a smidge past the attachment seam, and machine stitch in the ditch from the right side. Put one button at bust point level, and spread the others out from there. Easiest to space them evenly. Have the garment made up enough for you to try it on. Look in a mirror and place pins in the band where you want the buttons. Top button – at the neck, or placed for the effect you want. Lowest button – best to place this above your ‘hip break’ line or your top-of-sitting-thigh level, so it isn’t strained when you sit down. Button numbers and spacing are design decisions, for example you can put them in groups of 2 or 3, or at random spacing. Or how about every button different ! Then the extension to use is a judgement call, perhaps the average size. All week I’ve been adding little comments about how to finish the neckline of a front band top. And extras you can add to your button band top. This post got much too long, so I’ve separated off those comments. Start with the simplest, if like me you get overwhelmed by too many options. And here’s an earlier post on the opposite : closing a front opening. 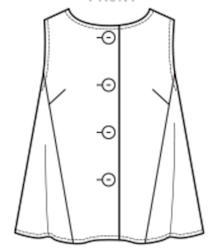 This entry was posted on December 1, 2018 at 10:01 am and is filed under pattern making for clothes. You can subscribe via RSS 2.0 feed to this post's comments. Both comments and pings are currently closed.